Imperfectly Painted: OPI Wooden Shoe Like to Know? I think this might be the first time I've had a brown polish on this blog. I have to admit brown has never been my forte, but I'm definitely warming up to the idea. I'm seeing more and more browns lately that are catching my eye, like this one from the OPI Holland collection. Wooden Shoe Like to Know? is a medium chocolate brown with a golden-pink shimmer. You know the color of hot chocolate? This is it. I actually was craving hot chocolate while putting this on. I really like this color. I like how it has some purple undertones to it, so it's not a harsh brown. The shimmer is a beautiful touch. I honestly do not think I'd like this color near as much without the shimmer. I think it needed it. If you're unsure of brown shades, this maybe a good stepping stone polish for you to see how you feel about the color. Your pictures show the shimmer so well! I adore the thought of brown with golden shimmer, so I picked it up. Haven't done my nails yet, but I look forward to it so much more after seeing your pictures. I went through a brown polish phase like many did after the greige's had hit hard. Initially I did not get this shade from this collection. Then had 2nd thoughts when I saw more blog photos of the shimmer in it. I don't get as much shimmer in my eyes as great macro shots do - but I have put a layer of CND effects gold shimmer over mine blending it into the top wet coat of the OPI and I get a shimmer I can really see all the way down to my toes! I love this color of brown. So pretty! This is one of the few I got from this collection and I love it! As soon as I saw which polish you were showing I knew you would write about loving the shimmer; we definitely have similar tastes that way. It is so pretty and unique. 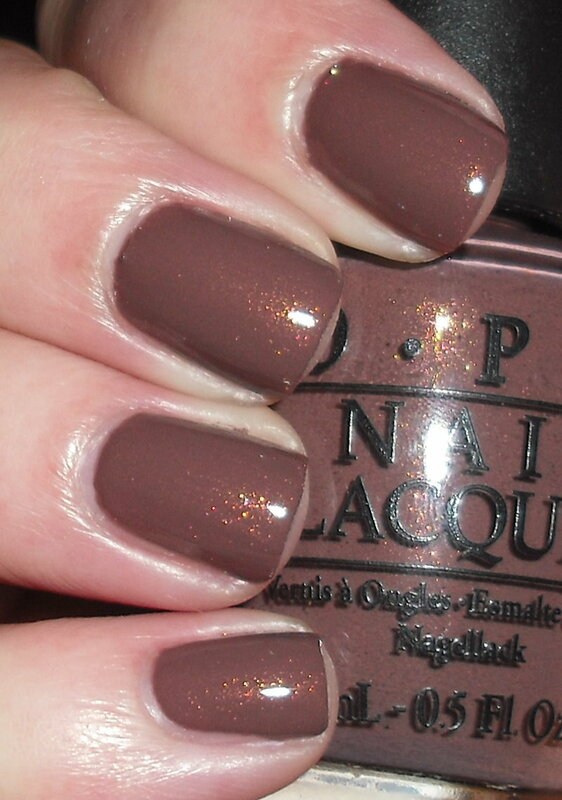 This brown by Opi is so beautiful with all that shimmer! I would love to see it in the sun! I think the shimmer really makes this polish!! It looks really beautiful on you! I"m not too big on browns but I also got this one!! Haven't tried it out yet. Looks good on you!!! It looks lovely on you, although I always wish the shimmer was stronger in these kinds of polishes! This looks amazing on you! The shimmer is poppin' way more in yours than in me. Maybe I need to shake mine up more. soo gorgeous.. think this is my fav of the hollands! When I wore this polish, it reminded me of chocolate milk! Absolute perfection on you! You just might need to wear more brown. This is one of the few I want from this collection.